Please refer to our stock # T 1831 when inquiring. SOLD -Thank you Ms M for collecting Made in USA and for the upcoming commission! Joyful Path indeed and this painting will be on display in a very joyful home in NH along with an upcoming commission. 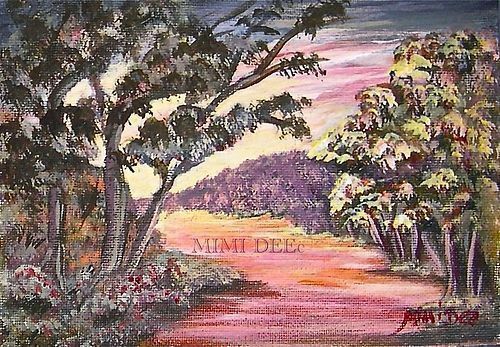 This small landscape, signed as Mimi Dee at lower right - a self learned painter, depicts a colorful path in warm colors leading through lush trees onto a soft buttery yellow hopeful horizon. Ms M. said, 'Mimi you capture the feeling so well with your title' . Original work by this artist has been exhibited in various area artist association shows since the 90s and at the previously open Methuen studio store gallery by the same name. This painter also makes hand wrought sterling silver sculptural metal work jewelry and other metal sculpture.